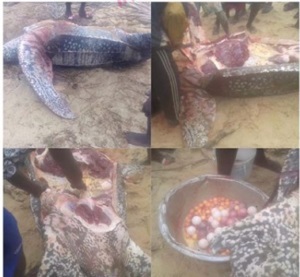 An endangered turtle has been caught and killed after by some Lagos residents who used it for meat. This is coming a day after a leather-back turtle, was saved from certain death by a woman, Doyinsola Ogunye, at Elegushi Beach in Lagos, after it came ashore. Ogunye, who ensured that the endangered animal was returned to the sea, shared several photos and videos of the animal and the attempts by some residents to kill it. She said that the animal had come to the beach because it wanted to lay eggs. However, this particular turtle couldn't survive the onslaught unleashed on it by the Lagos residents.